Steel frame can also come in cushion, sling, or strap. Because of the strength of steel there are certain styles that are best done in steel. If you live in a windy spot you’ll like the weight of it. If folks at your house are large or rough on things, steel can put up with the abuse. 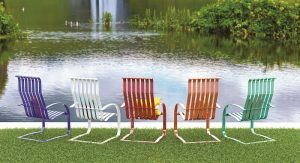 On many coil spring chairs, the tensile strength of the steel gives a different bounce and range of motion than the aluminum. You can decide which you prefer when you come into our store and give them each a test drive. There will probably be some level of maintenance with steel products as regards rusting at some point in the life of the chair. But as our Homecrest rep Matt Kotowski likes to say, “They don’t build bridges out of aluminum!” Every frame material has it’s advantage. Steel frames come with slings or cushions.